Today I'm thinking about the romance of rice. So many cuisines in every corner of the globe have rice as a key element of their daily diet. It has a central place on tables throughout Asia, Africa, North America, Latin America and Europe. And since there are so many different types of rice and ways to prepare each type, it never loses its allure. Since rice forms such a nice canvas for so many additional flavors, it’s easy to imagine many different and delicious versions of a simple rice pudding. Escoffier made rice pudding fancy by adding gelatin, folding in whipped cream and glacéed fruit and molding it into a dessert called Riz a L'Impératrice. 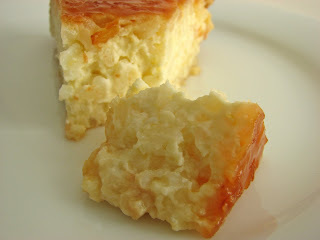 Gâteau de Riz is another French style of rice pudding that is poured into a caramel lined dish or pan and baked. 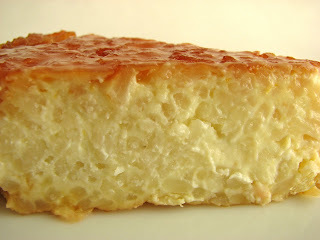 If you enjoy rice and you like crème brulee, I think you’ll also savor Gâteau de Riz. It’s creamy, a bit rich and the citrus strikes just the right note. The French do have their ways. - Be super-super careful when swirling the caramel in your dish or pan. The caramel is going to be very hot and will make the pan hot as well very quickly. Use an oven mitt if you have one. This will also help avoid accidentally spilling any on your hands. Caramel burns are very painful so exercise an abundance of caution. - The darker the caramel the less sweet it will taste. You can smell when it’s ready and just about to smoke. Don’t forget it continues to cook and darken very rapidly even after you take it off the heat, so you want to catch it right before it looks perfect. 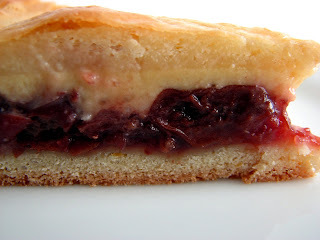 - I baked mine in a 9" cake pan, but this dessert can be a bit tricky to unmold, so you can use a casserole dish and simply spoon it out if you don't want to risk it. 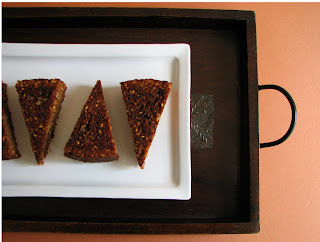 - Some versions of this dessert add raisins soaked in rum. If you have a vanilla bean, you can use half of the bean in place of the extract for a stronger vanilla flavor. There are many possible variations. I prefer this simple version, but let your imagination run if you’re in the mood to experiment. Also, you can certainly try this with Arborio rice or other favorites. 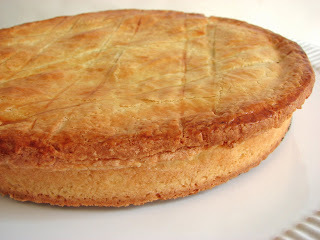 - Any remaining portion of the Gâteau will keep tightly covered in the refrigerator for a couple of days. 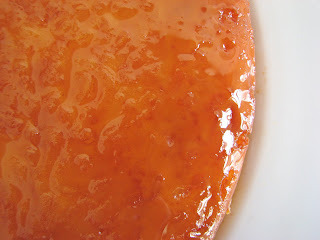 Caramelize 3/4 C of sugar with the 3 T of water until deep caramel in color. Remove from the heat and pour into the bottom of a 9” cake pan, 1 1/2-quart terrine, casserole, or Pyrex baking dish. Swirl very carefully and gently to coat half-way up the sides. Bring the milk, cream, sugar and salt to a slight boil. Add the rice and citrus zest. Lower the heat and simmer, stirring occasionally, for 40 to 45 minutes. Whisk the eggs together. After rice has simmered, take off the heat and whisk eggs into the rice. Add vanilla extract. 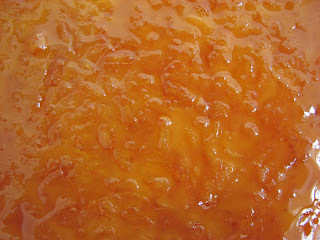 Pour the rice pudding into the caramel dish, place it in the center of the oven and bake until the caramel begins to bubble up the sides, about 10 to 15 minutes. Cool and serve. Luxuriate in the romance of rice. Perhaps I was a horse in another lifetime. I really love oats. I love the unmistakable flavor, the slight earthy smell and the absolute chewy satisfaction. So many lovely lingering oat experiences under our belts. I’ve never forgotten the incredibly light and delicate crispy oatmeal wafers I once bought in an airport in Mexico City on my way to Oaxaca. Sigh. Oats form a nice canvas for various spices. They also welcome the friendship of apples, cherries, plums, peaches, dried fruits, nuts and assorted other embellishments. I’ll always favor a recipe or a product if it has oats in it. So it makes perfect sense that while browsing through Regan Daley’s In the Sweet Kitchen, I was more than intrigued when an Oatmeal Stout Cake recipe jumped off the page at me. The cake features steel cut oats that are soaked in dark stout beer as its principal ingredients. I had to try this! I’m happy to report the results are definitely worth the mix. This cake is an interesting variation on the oat cake theme. Steel cut oats provide a sturdy chewiness to the slightly dense and very moist texture of the cake. Soaking them in a stout beer adds a great flavor note and the smell of them once they sit for a couple of hours is really intriguing. The cinnamon, freshly grated nutmeg and citrus add just the right warmth and depth. I say, check it out. - The “old fashioned oats” called for in the recipe are coarse Irish steel cut oats, not instant. The most easily acquired product is McCann’s Irish Oats. - The recipe has a broiled topped that I’ve omitted. I think the cake is sweet enough without it and I also have a thing about sweetened condensed milk. But if you’d like to give it a go, I’ve included it below the main body of the recipe. - I used Guinness Extra Stout, a lovely dark beer with a pronounced aroma of malt and very, very slight hints of some aspects of coffee and chocolate. - Although the directions call for baking the cake for 55 to 65 minutes, mine was done in 45 minutes. My oven runs a bit hot, but do check it at the 45 minute mark. Combine oatmeal and stout in a non-reactive bowl. Cover with plastic and chill for two hours. Preheat oven to 350F. Prepare a 9-inch springform or 9-inch round cake pan with 3-inch-high sides. Line with parchment and lightly grease the paper. Sift the flour, baking soda, salt, cinnamon and nutmeg. Combine the sugars. Drain the chilled oat mixture, reserving the stout. You’ll have about 1 C of stout. Cream the butter and sugars until blended and slightly fluffy. Scrape down the bowl. Add eggs one at a time, mixing thoroughly after each addition. Add vanilla and orange zest. Scrape down the bowl. Add the flour mixture to the creamed butter mixture in three steps, alternating with the reserved stout. End with the final addition of flour. Be careful not overmix. Fold in the oats with a rubber spatula and scrape the batter into the prepared pan. Place in the center of the oven and bake for 45 to 50 minutes or until a tester comes out clean. Cool the cake completely on a rack before serving. This cake will keep for several days if tightly double wrapped. Preheat the broiler. Mix all ingredients for the topping together while the cake is still in the pan. Toss it over the cooled cake. Place under the broiler and cook until the topping is golden and bubbling. Watch it closely as it will burn very quickly. Cool for at least 10 minutes, then serve warm or at room temperature. The very first bite of a fresh baked scone is enough to make you feel like you’ve just had a daydreamy moment in the Royal Palace. 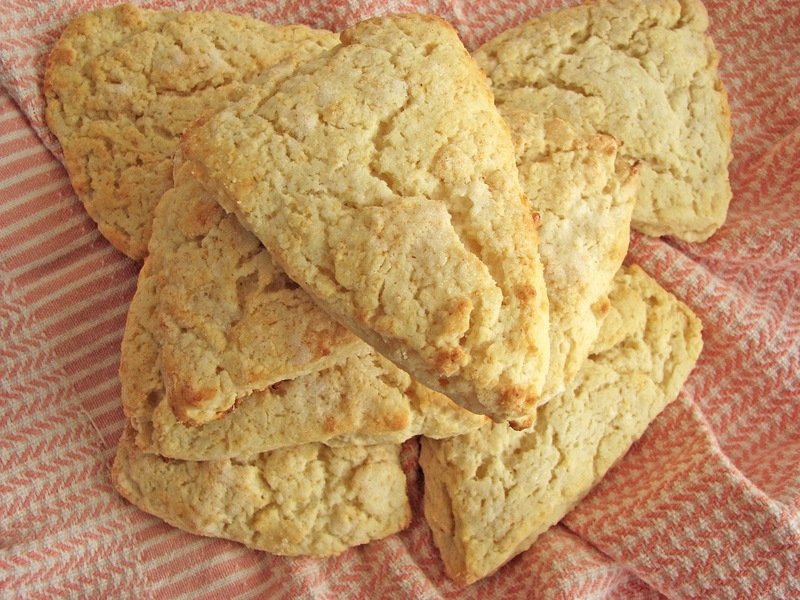 There’s something about the light and tender loveliness of homemade scones that is transformative. Sadly, not so with purchased ones. How many times have you bought a scone and felt less than delighted? OK, most of us can’t count that high. But we keep searching anyway even though we have plenty of empirical evidence that most commercial scones are over-mixed, over baked, frozen hockey pucks that taste like not very much of anything. So hey, here’s the scoop! Scones are definitely one of those pastry items that cannot be mass produced. Great scones require very minimal, very gentle handling, something that’s not possible in a large pastry production environment. But we do love the idea of a scone, don’t we? Here’s the answer. Inside half an hour, you will be enjoying the most remarkable scones ever. 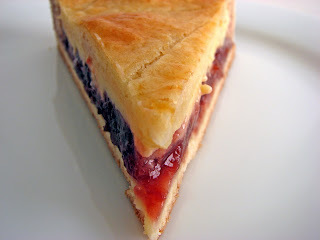 This recipe is from my lovely pastry school teacher years ago, Cathy Burgett. It is the best recipe I’ve ever tried. Truly, these Cream Scones are Dream Scones. Since all the fat comes from cream and not butter, the final product is as soft and comforting as your favorite bedtime pillow. The one you look forward to at the end of a long and harried day. Why not wake up to this little bite of heaven on a plate some lazy weekend morning? You’ll never buy another scone again. Really. Of course the traditional way to eat a scone is to lavish it with a bit of fresh jam and a dollop of fresh whipped cream, a real jaunt to the Cotswolds. Do try this sometime when you are feeling extra indulgent and no one is looking. - Remember this! The secret to great scones is a very light touch when mixing and forming the dough. This recipe requires precious little handling. This non-technique technique is what creates a melt-in-your-mouth tenderness that is the lost memory of The Legend of the Greatness of Sconery. 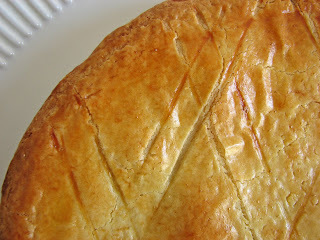 - This recipe is the purist version. I’ve also tried adding a shake of lemon zest to the cream for a brighter taste. The combination of dried pear, finely chopped crystallized ginger and golden raisins is one of my favorites. And of course the classical addition is dried currants. Just add the extras to the dry mix before adding the cream. 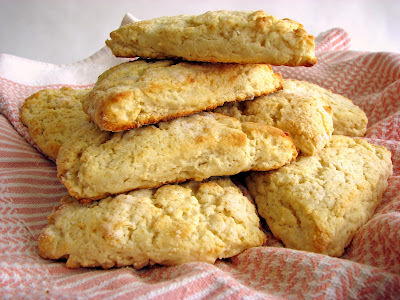 - Due to an oversight in shopping, I once made these with a combination of 3/4 C heavy cream and 1/2 C buttermilk for the liquid with great results. - Scones are absolutely meant to be eaten fresh out of the oven. 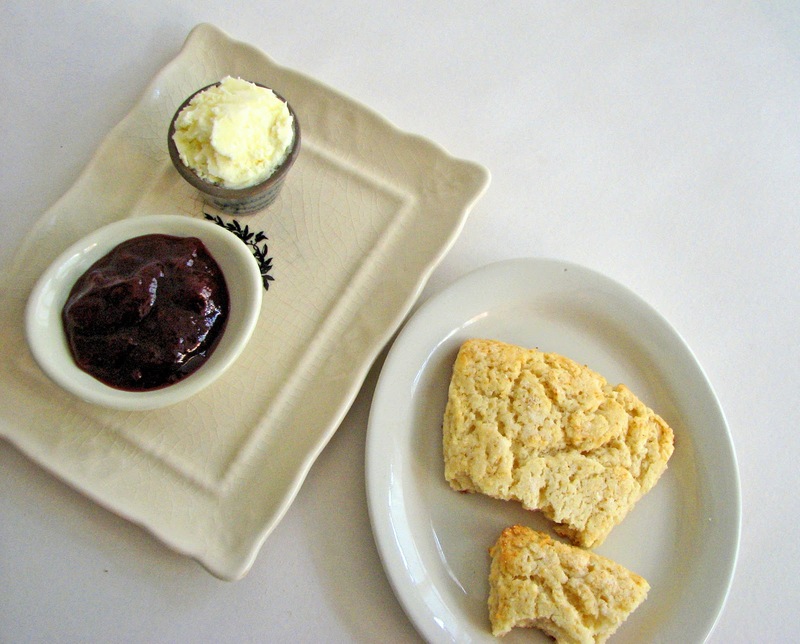 For the optimal scone experience worthy of a spot of good Earl Grey straight from the palace, eat them right away. Preheat oven to 425 degrees. Line a baking pan with either parchment or a silpat. Sift or whisk together the flour, baking powder, salt and sugar in a mixing bowl. Add the cream and stir gently with a fork. Stop mixing when it starts to come together and the cream seems fairly absorbed. Be careful not to overmix. The dough will look loose and lumpy and not like a finished dough. Pour the mixture onto a lightly floured work surface. Flour your hands a bit and using a very light touch and absolute restraint, begin to gather and gently pat into a 9” circle, taking care to press the edges into a solid border. It will come together just enough to look like it might work. Do not handle very much to achieve maximum tenderness! 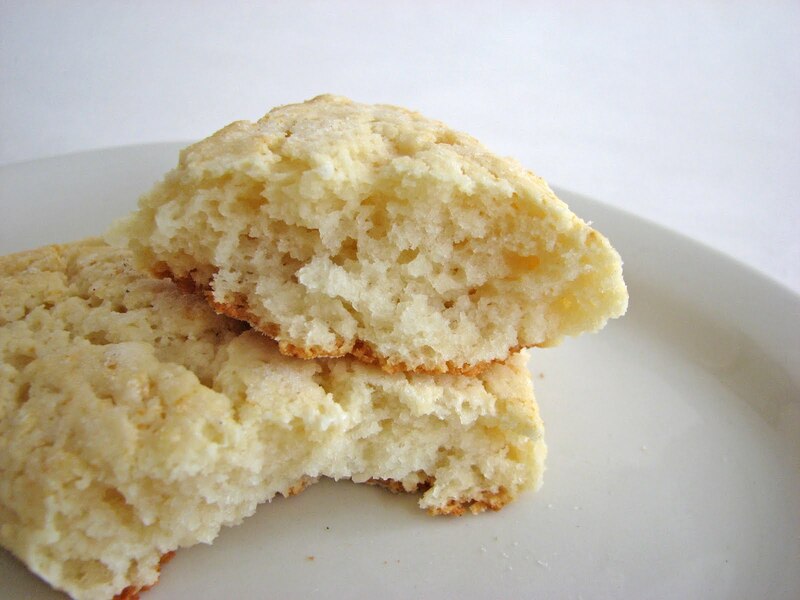 Using a lightly dusted bench scraper or sharp knife, cut into 8 scones. Use the bench scraper or a metal spatula to lift the scones gently onto the baking sheet. Be careful as they are very soft and delicate to handle. Brush the tops with a bit of melted butter and a light sprinkle of sugar. Bake on the middle rack for 15 minutes or until they are golden. Serve immediately. Enjoy the true meaning of scone-iosity.